"It's impossible not to be afraid of dying, but I'm too stubborn, too much of an animal to believe it." Jean-Pierre Melville's status as the great French master of film noir has been ratified in recent years by some Criterion releases (like Bob le flambeur) that I and others have mooned over, but there's undeniably a second, more grave strain of his films having to do with the French Resistance. 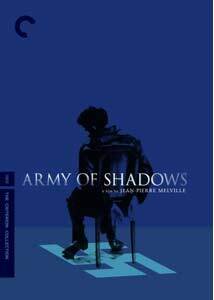 In much the way that Le Cercle rouge is his grand summation of crime pictures, Army of Shadows, made the previous year, is the ultimate Melville Resistance film. It may not be as pyrotechnic as some of the crime pictures, but it's so quietly and deeply felt, and so obviously haunted by personal experience, that it's not as easy to shrug off as even the very best cops-and-robbers films. It's a galvanizing story of good people in the worst of times, and how far one can stretch one's personal morality in the face of the worst horrors imaginable. Lino Ventura is wonderful as Philippe Gerbier, a civil engineer whose work with the resistance lands him in a POW camp, where he befriends an avowed young Communist, who helps him hatch an escape plan. Even more mesmerizing (and a bit late to the movie) is Simone Signoret as perhaps the most prominent woman in the Resistance, whose steely resolve to fight is put to the most brutal test by her tormentors. Somewhat peculiarly for a war movie, this one has an almost dreamy, ethereal quality—it doesn't shrink from the worst of it, but somehow it's not an unrelenting nightmare, even as violence and mayhem seem to infect every frame. It also has elements of an old-style police procedural, especially as the freedom fighters seek to break one of their own out of a Gestapo prison camp. It very much feels like Melville is using the lessons he's learned from his crime pictures and using them on a grander and more brutal scale. The moral quandaries the fighters are faced with are desperate ones with no good answers—what are they to do, for instance, with one of their own caught ratting them out to the Germans? Will they be reduced to the level of the barbaric murderers they fight? What if they are asked to choose between family and the cause? There's something decidedly existential about the movie—it's not long on character development or relationships, and we know the main band of characters simply by what they do, along with noms de guerre like The Barber and Le Bison. Which makes it that much more chilling, probably, for things end neither in triumph nor tragedy, but with an even deeper feeling of terror of what we're capable of under extraordinary circumstances. Melville isn't for you if you want all sweetness and light; but as filmmaking, it's a resonant, unqualified triumph. Image Transfer Review: Melville's palette is bleached out almost entirely, making this a movie almost entirely of gray—the slightest swatch of color can be absolutely blinding, and the recent restoration of the film makes it look simply extraordinary. Similarly, Melville frequently favors tracking shots, but the camera moves with such slyness and without calling attention to itself that the bravura work is all clearly done in service of the story only. Audio Transfer Review: Either the mono or the 2.0 French track will do—the sound isn't as breathtaking as the picture quality, but it's a fine, clean transfer. Extras Review: Another grand, full-boat set from Criterion. Disc 1 includes the film, two trailers (one from the 1969 original French release; the other from the 2006 U.S. release) and a thorough commentary track from Ginette Vincendeau. She never quite gets to the bottom as to why the movie took almost thirty years to make it across the Atlantic, but she's excellent on Melville, his cast and crew, the place of the movie in his body of work, and the novel on which the movie is based. Especially fascinating is her blow by blow on the ongoing battle between Melville and the writers at Cahiers du cinéma, who didn't cotton to Melville's politics and kept him out of the auteur pantheon for years. Vincendeau occasionally presumes an extensive knowledge of French film, so some of her allusions may seem arcane to even the most discerning cinephile (she lost me more than once); also, she makes the occasional factual error (the big band song playing in a London dance hall is not In the Mood, but Stompin' at the Savoy). Disc 2 is jammed with information both on the filmmaker and the historical epoch he depicts. Jean-Pierre Melville, Filmmaker (04m:52s) is a 1968 piece from French television, showing the director on set with his omnipresent cowboy hat, and reflecting on his own experience in the war. (He fought with the Resistance, and as an Alsatian Jew, faced particular peril from the Nazis.) His cinematographer comes to the other side of the camera for Pierre Lhomme: Revisiting a Masterpiece (14m:06s), in which he discusses the sorry state of the print before the recent restoration, and goes over the working methods of the director from back in the day. Accompanying this is a restoration demonstration (07m:12s), a fascinating look at a painstaking process; and a gallery of color tests both before and after restoration. (On a smaller television, these may be difficult to discern.) Françoise Bonnot: Editing with Melville (10m:55s) is a 2006 conversation with the cutter, whose mother preceded her, performing the same role on earlier Melville pictures like Le Samouraï. L'Invité du dimanche (30m:16s) is another French TV piece, from March 1969, featuring on-set interviews with Melville and prominent members of the cast. Melville et L'Armé des ombres (27m:31s) (that's the film's French title) is newly produced, featuring reminiscences from Lhomme, Bonnot, and cast member Jean-Pierre Cassel, among others. And the final three documentaries are about the historical circumstances of the story, yoked together under the heading The Resistance. Le Journal de la résistance (34m:09s) was produced in 1944, by a battalion of French cameramen looking to rehabilitate their nation's reputation as having capitulated to the Germans. It's narrated by Noel Coward, and features no shortage of vérité footage of the terrors of German occupation. Next is a look at Simone Signoret and Lucie Aubrac (05m:25s), on whom Signoret's character was based, filmed in 1984. And some of Aubrac's comrades are featured in a 1973 television piece (23m:20s) called Ouvrez les guillemets, in which members of the French Resistance discuss their wartime experiences. Finally, the accompanying booklet includes illuminating essays (jammed with plot spoilers) by Amy Taubin and Robert O. Paxton, and excerpts from an interview with the director. Criterion makes up for lost time with a vengeance—this movie, unavailable in the U.S. for close to thirty years, looks stately and crisp on DVD, and the accompanying extras illuminate both the director's working methods and the historical circumstances of the French Resistance. At its core, though, it's a war story as a psychological horror movie, one that's made with the highest level of skill and that looks unflinchingly at the worst of us.